The Lok Satta is not opposed to the formation of a separate Telangana State but it believes that a solution to its problems lies in total decentralization of power and resources through formation of district governments. The Lok Satta Party’s Election Campaign Committee members told the media that a separate State could always be carved out if the people wished it, by following the procedure prescribed in the Constitution. When more than 80 countries in the world are less in area than a district in Andhra Pradesh, formation of a Telangana State is not a big deal. 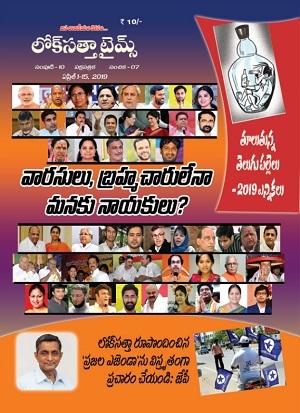 The Campaign Committee comprises Prof. Kodandarama Rao, Mr. Bodepudi Satyanarayana, Mr. K. Dharma Reddy, Mr. Dommata Venkateswarlu, Mr. Juluri Satyanarayana and Mrs. Gita Murthy. these area radical promises. will be great if these can be done. But, if you look at history simple rules like mulki rules, and GO610 could not be implemented. How can you assure the people of telangana that these will be addressed? preaching is easy but implementation is difficult even then we should not loose confidence.we can fight with one weapon vote to elect genuine leaders. 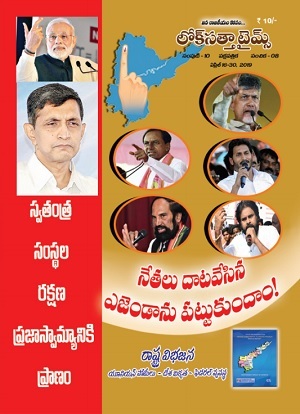 does loksatta ever fighted for this agenda items? no body bother if 610GO, mulki rules not implement. ఇవి ఎప్పుడైనా KCR మాట్లాడారా ??????????? Stupid People! I am from Rayalseema and I wish Telangan is formed. Though I agree that there must be some consensus arrived upon Hyderabad. We should remeber our fight against Madras state before condemning t-movement. I firmly believe you do not have much knowledge of History other than dining table discussions. Look into the history of seperation of the state from Madras constituency. FYI.. The Madras state itself is non existent now... of which Tamilnadu was just a part.Madras constituency was made by British and had no cultural or any other kind of standing of its own. Formation of states was done on a seperate basis...If states was the solution for fighting backwardness.. India itself should not exist where for every 100KM. at least the dialect of the language and the culture of the people changes ! !